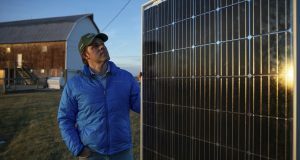 Although Wisconsin's still lags behind its neighbors in its number of solar jobs, the state's energy sector managed to add more in 2018 even amid a national slowdown for the industry, according to a new report. Bob Bishop is a 61-year-old farmer living in dairy country in southwestern Wisconsin but will stop raising cows because falling dairy prices have put his industry at serious risk. Tagged with: Madison Gas & Electric Michael Vickerman RENEW Wisconsin solar energy solar power Wisconsin Public Service Commission Wisconsin Public Service Corp.
Gov. Tony Evers told a room full of renewable-energy advocates on Thursday that solar projects and similar installations that flooded into Wisconsin in 2018 occurred even as many state policies continued to ignore, rather than embrace, science and innovation. Residents in a rural Wisconsin county are split over a Chicago developer's plan to work with two Wisconsin utilities to build a solar farm that would include more than 1 million solar panels. Growing plants year-round is not easy near the often-frigid, wind-swept Chequamegon Bay of Lake Superior. Dane County plans to spend record amounts in 2019 on infrastructure and help build one of the largest solar farms in the state, according to a budget proposal from County Executive Joe Parisi. On Jim Tinjum's #bikethewind tour last year, he could often see the installations he was visiting for miles before he got to them — turbines towering gracefully in the distance.